Breakfast is one of those difficult topics. There are believers on both sides of the issue. Some people believe that it’s the most important meal of the day. Others swear that skipping breakfast is their only hope for weight control. Rarely can these two camps find common ground. A new report from the Harvard School of Public Health shows that skipping breakfast can be bad for your health. So, first things first. This study was NOT funded by Tony the Tiger, or any of his Kellogg’s friends. This was a real study, published in the peer-reviewed Circulation journal. So there, breakfast haters, this is real science. The research followed 27,000 men over 16 years, a substantial collection of data. These men were between 45 and 82 and in generally good health at the beginning of the study. Over the period of study, more than 1,500 of the men died of heart attack or heart failure. When the researchers looked at the data and the recorded eating habits of the men, a pattern emerged. Even after eliminating other contributors to cardiac problems, like obesity, smoking and metabolic issues, men who ate a meal within an hour of waking were healthier. A lot healthier, in fact. Men who skipped breakfast were more than 25% more likely to have heart disease than men who eat breakfast. Previous research (some of it at Harvard, too) showed that people who ate breakfast enjoyed more stable blood sugar levels than those who ate their first meal at lunch time. Listen up, everyone who’s following a glycemic index diet: this can be a key to insulin control success! So, does this mean you should dive into a plate of sausage and eggs tomorrow? Probably not. The benefits from eating breakfast would be crushed by the negative impact of all that grease. 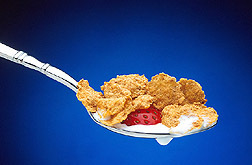 On the other hand, a nice bowl of whole-grain cereal, maybe with some strawberries sliced across the top? Now that’s a breakfast that could keep that heart ticking for years to come.